Heavy equipment operators have been trained to recognise the geological conditions of sites especially in terms of the excavation processes. Engineering Geologist Professor and Consultant, from the University of Puerto Rico Mayaguez Dr. James Joyce facilitated the training hosted by the Department of Disaster Management (DDM). The workshop’s participants were drawn from the various fields of construction and building development, ranging from heavy equipment operators, engineers and architects to contractors and planners. 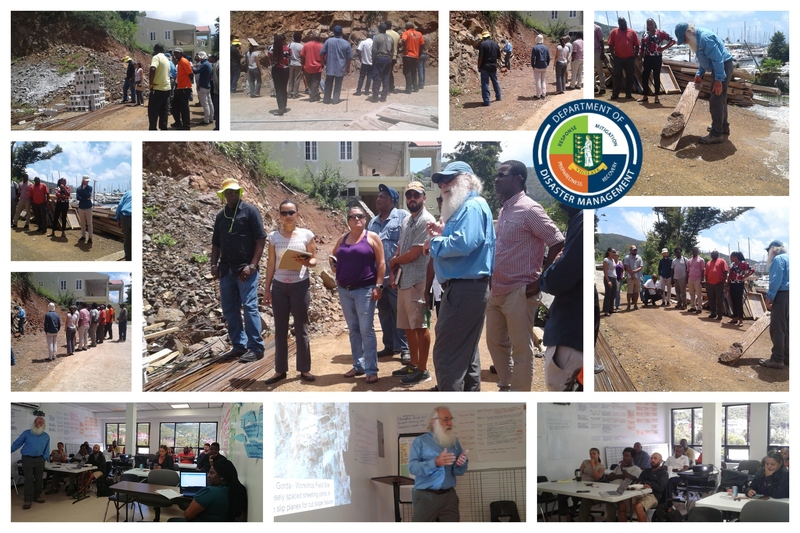 The workshop was designed to allow participants the opportunity to determine the appropriate cut/slope definitions for building sites based on the geological formation of the BVI. The information shared is expected to help provide precise data that enables these professionals to obtain better guidance in the design and construction phases of development projects. Dr. Joyce said this also gives them the opportunity to know how to evaluate their surroundings and to recognise where they may encounter problems in stability. He said heavy equipment operators are generally the first persons on site during the development stages which requires them to have a deeper understanding of how critical it is to be aware of the geological location of the land. The engineer also shared with the group the importance of scoping the land and cautioned operators that although there are maps provided to give an idea of what to expect during excavation, it is still advisable to have building professionals on the ground to advise on stability of the land. Attendees visited a new building site as part of the workshop where there was a demonstration of the different features that have to be considered, including the geological features and physical structures. Local Architect and Contractor Mr. Steve Augustine, commented on the workshops significance to his profession and how beneficiary the information was for his colleagues. Dr. Joyce’s 45 years of experience in the field has allowed him to share critical information with professionals throughout the Caribbean and to offer advice on the proper building techniques for specified geological locations. He will remain in the Territory until Friday, September 7 to collect geological data for Frenchman’s Cay, Little Thatch and Salt Island in order to complete the geological maps currently available at the Department of Disaster Management.